Later, when browsing through simple knitting patterns, I saw my first knit and felt pattern. Coasters knitted from wool yarn, and then felted. I decided it would be a great project for my "stash of unusable handspun wool yarn". My first coasters did not get the shrinkage, anticipated. My Border Leicester wool did not shrink to half in size as did the wool in the pattern. All was not lost, I now had two sets of felted hot pads. I still had some more stash, so I scaled down the pattern, figuring in the shrinkage, and ended up with a set of coasters as well. The hot pads gets used all of the time! 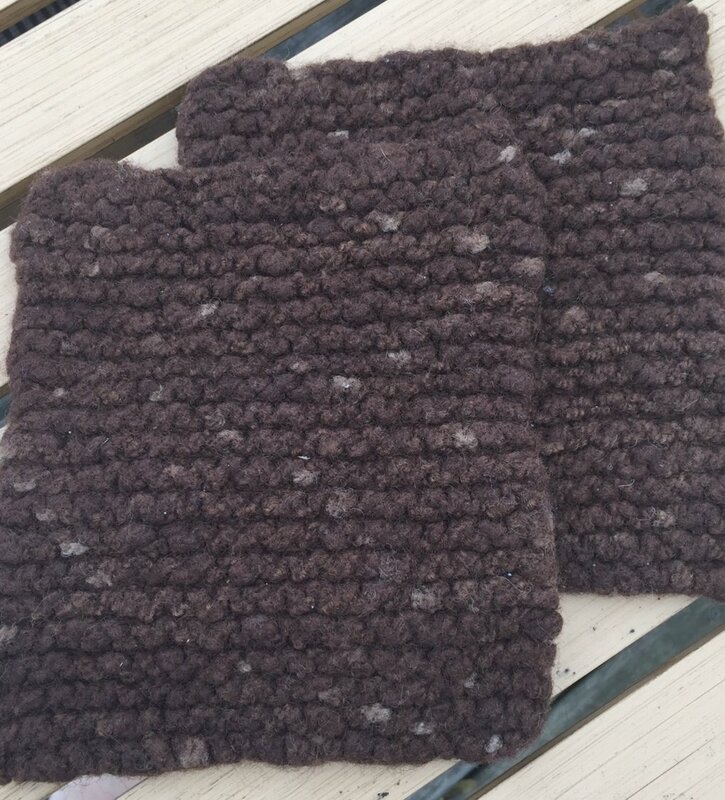 I had some balls of leftover handspun yarn and decided to make a couple more hotpads. No pattern was used, I kept it simple. 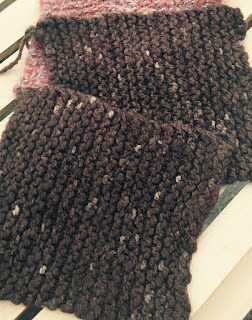 I knit in a garter stitch (all knit stitches) With the yarn I was using, I figured in about 25 shrinkage in width, and 40 percent in length. When felting, I just use the washing machine. To save on hot water, I threw them in with a load of dryer balls, I was making. After the second wash, they had felted down to where I wanted them to be. If I wanted no knit stitches to show, I could wash again. 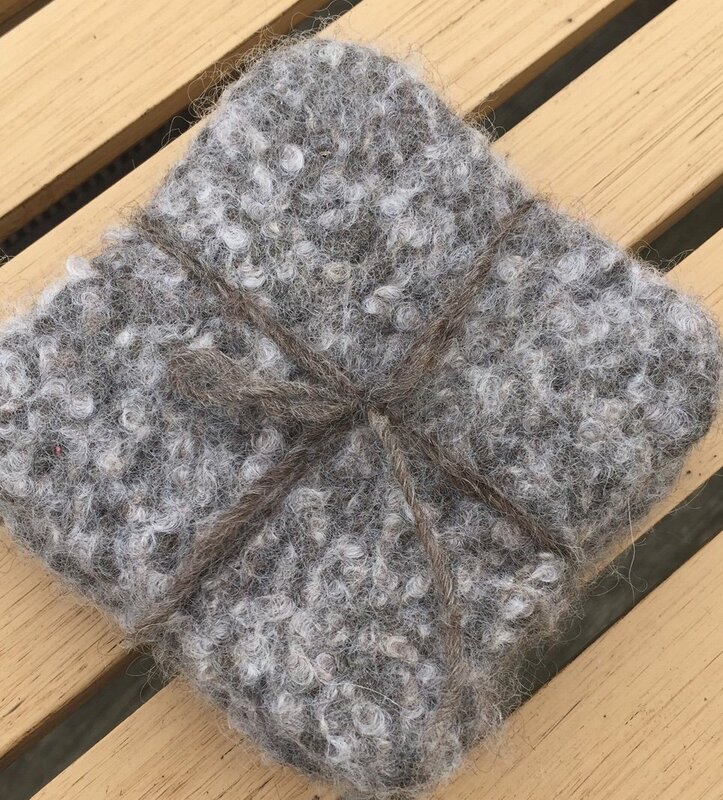 By felting you take a knitted item, and make it more durable (great for hot pads, bags, etc) It also gives your knits a completely new look. It also hides mistakes (in knitting and handspinning) I was able to take my unusable handspun and make something useful. Win-Win! They wouldn't win any beauty contest, but they work like a charm! Here is a site that has several felted hot pad tutorials/patterns. Ravelry is another great place to find patterns. Oh gosh, now you've done it. I have about a thousand things to do, but now all I want to do is go raid my stash and make coasters. I love yours! Thanks :) it is a great way to use up so e stash! Great way to use up the stash! fantastic..I love felting! 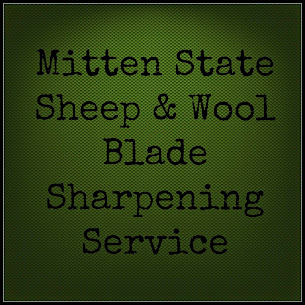 Brings a whole new dimension to the uses of wool. Have you looked at how they make boots in Mongolia!! Gorgeous designs and decorations. Well that should keep the bottom of your coffee cup nice and warm! I love them! I just started getting even more into knitting. I started listening to a podcast called woolful. Love it!! Thanks Three Sisters and Us for the info about the podcast. I'm going to listen while I spin. This is a great idea- I have no end of knitting with mistakes in it, so I can see that felting will be useful! I have also never heard of ravelry before, so thank you for sharing the links. I love your knit hot pads you made! I co-host a blog party on Monday's called Cooking and Crafting with J & J at Julie's Lifestyle. I would love to have you come and share this with us. Thanks.